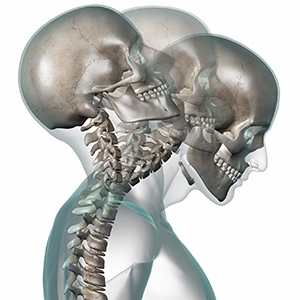 Whiplash injuries can occur from vehicle collisions at speeds as low as 5 to 10 mph. Injury severity can depend on other factors such as head rest position, gender, position of head at impact and others. There does not have to be a significant amount of visible vehicle damage to cause significant occupant injury or whiplash. Vehicle bumpers are designed to “shrug off” impacts less than 15 mph. Unfortunately, your vehicle can accelerate from zero to 15 mph in the blink of an eye and this quick acceleration is what can cause a whiplash injury. As we age our tissues are less elastic and more “brittle.” This affects injury rate with sudden acceleration/deceleration forces such as with whiplash. The loss of elasticity exists in our muscles, ligaments and discs between our spinal vertebrae. When your 10-15 lb head is accelerated violently front to back or side to side, the tissues in the neck are where the injury occurs. 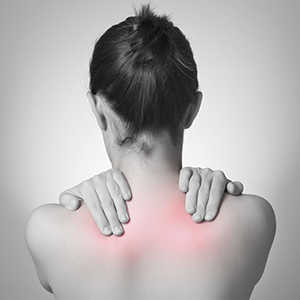 If the whiplash heals incorrectly, chronic pain can set in and significantly decrease quality of life. A study published in the journal Spine in 1998 identified 85% of people who were symptomatic 3 months after an accident will remain so after 2 years. 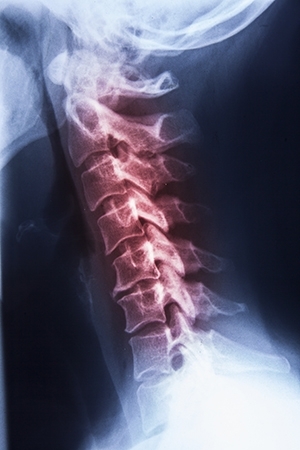 Although most people experience pain from a whiplash injury immediately or within a few hours, some may not feel pain for days for even weeks. It is important not to ignore the pain from whiplash. The chronic pain is more difficult to treat once it begins. It makes more sense to treat the injury as it is healing. This is the same approach with post surgical orthopedic surgeries. In most cases the joint is rehabilitated during the healing process not after. Improper rehabilitation in either case can result in undesired stiffness and chronic pain. It is important to be evaluated as soon as feasible after a whiplash injury. Furthermore, you should be evaluated by medical professionals with the experience and desire to treat this injury. Most family physicians do not want to evaluate or treat these injuries due to many issues including insurance and legal matters. Patients are often stuck in between trying to figure out if they should be checked and then who to see. As this time passes, the injury continues to heal improperly or stiff because to move a injured neck or back after whiplash causes pain. Pain is a general indicator to avoid moving. This is a common scenario. Our office is a resource for many medical professionals in the area who do not specialize in evaluating and treating these injuries. Call our office and be seen the same day. It’s the way we do it, because it is that important.